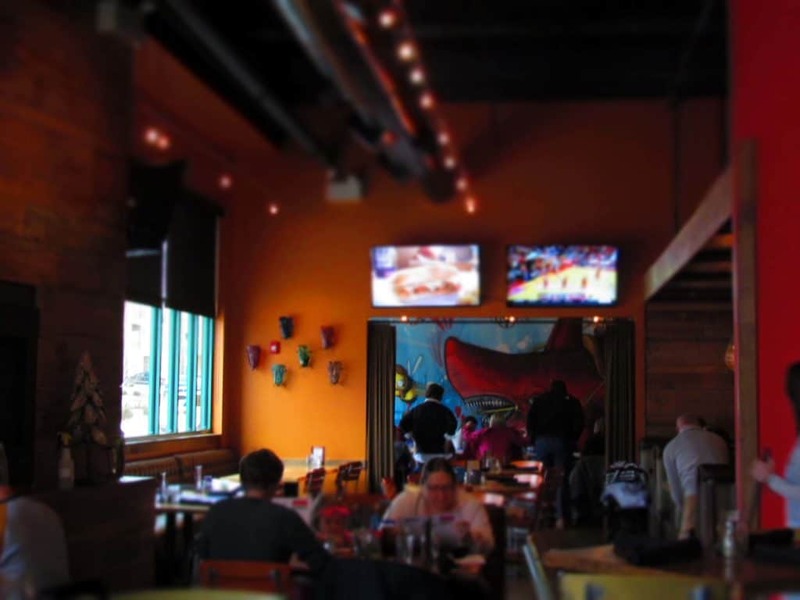 A few weeks before our visit to Prairiefire, we had been in Manhattan, Kansas. 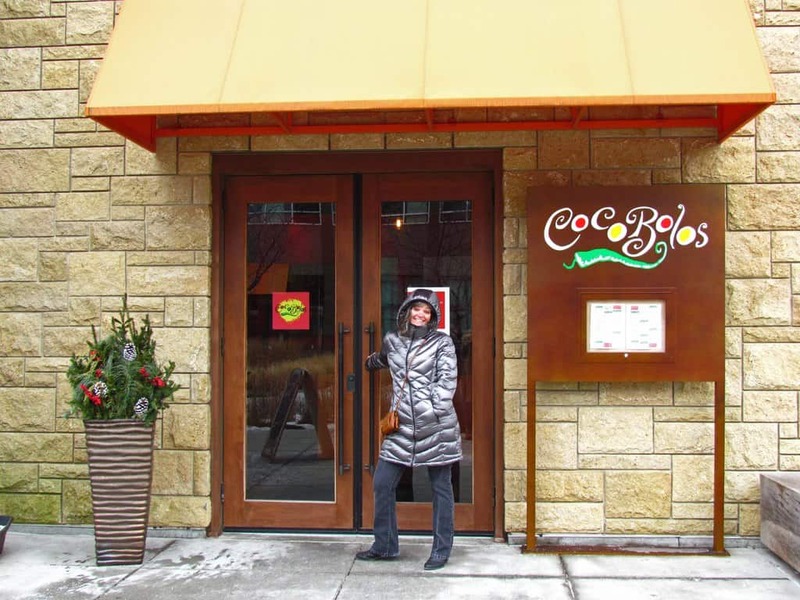 While there, I noticed a restaurant named Coco Bolos and wondered what type of food they served. Our travels that day didn’t allow me to check, but when planning our visit to this Overland Park neighborhood we got a second chance. We contacted the restaurant to let them know we would be dropping by after our museum visit, and then we just waited with anticipation. We want to thank Coco Bolos for their hospitality. Rest assured that all opinions are our own. The off and on bitter cold in Kansas City hit with a resounding ON the day we arrived at Prairiefire. By the time we were heading to lunch, the wind chills were brutal, so we weren’t too surprised to see a lackluster crowd in the restaurant. In fact, we were surprised to see so many, considering our arrival time was mid-afternoon. The brightly colored interior has a playful feel, which helps spark the adventurous mood. We were hoping the menu would mimic the atmosphere created by the various wall decor. We were greeted by the owner, Fred Merrill, and he explained a little about the restaurant, as we made our way to our table. The Prairiefire location is the second for the company, with Manhattan being the start of it all. We will have to make a point of checking the original out on a future trip. 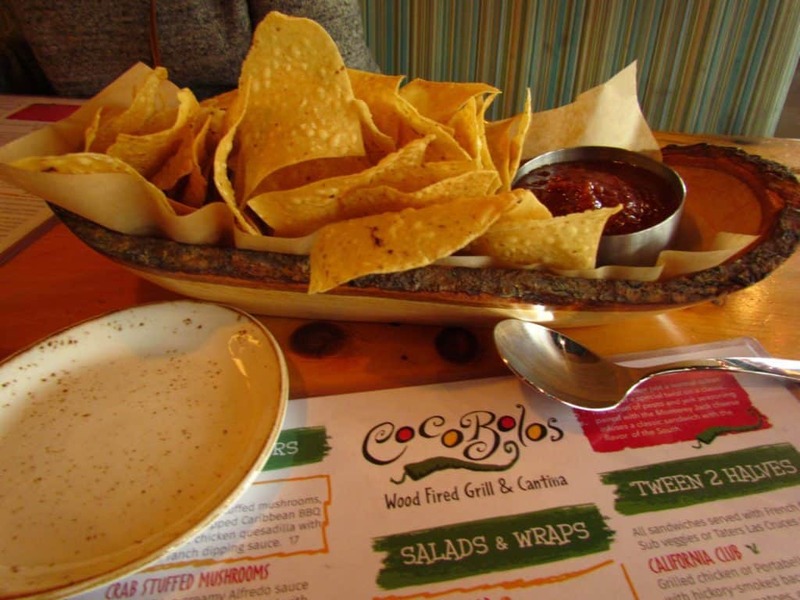 As we began scanning the menu, our server arrived with some chips and salsa. We noted the unique wooden bowls they are served in, which is a nice touch. The chips were fresh and the salsa had a nice kick without being over the top hot. We skipped cocktails (A margarita would have been good in retrospect) and stuck with water for our drinks. 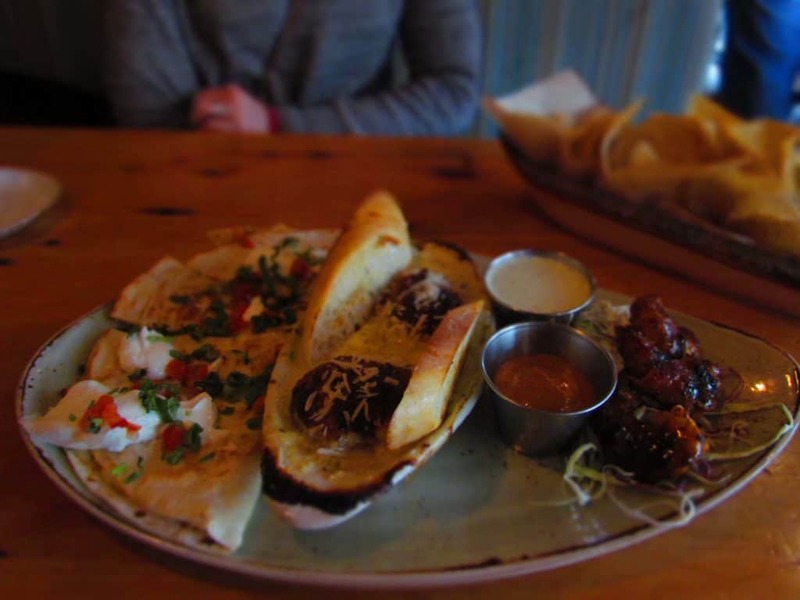 Fred came by to see how we were doing, and it gave us a chance to discuss the food selections at Coco Bolos. He explained that the restaurant attempts to offer a good variety of cuisine styles, but puts their own spin on them. Many of the dishes present a little spice to kick them up a notch. The key is that the meat is wood-fired, so it adds a delectable layer to the flavor of the dishes. We decided the only true test would be to sample as much variety as possible. We started with the Trio Appetizer, which includes three of the most popular appetizers. Three bacon wrapped shrimp brought a hint of spice with the Caribbean BBQ sauce. A small saucer held crab stuffed mushrooms floating in a delicious mushroom bisque. While Crystal doesn’t like mushrooms, she was surprised to thoroughly enjoy the soup. 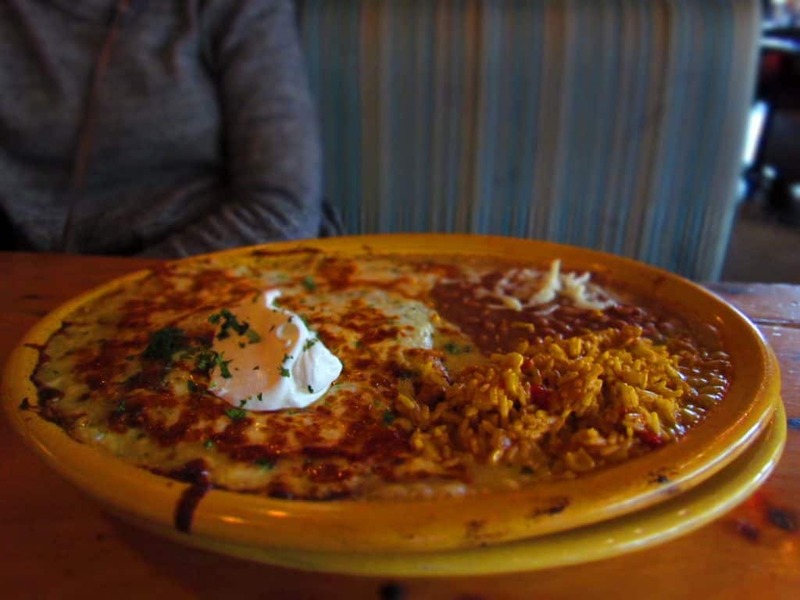 The plate also included a chicken quesadilla that was accompanied by a jalapeno dipping sauce. Now they were turning up the heat a notch. We grazed on these items, but knew we would want to save room for the main courses. Looks like we would be packing leftovers this day. Crystal wavered between dishes, but finally decided she was in the mood for something with some southern flair. The Chicken Enchilladas Suizas looked good to her, but she didn’t quite realize just how formidable the entire dish would be. Consisting of three chicken stuffed corn tortillas it has a red chili sauce, and is topped with a generous helping of Monterrey cheese. The entree is accompanied by a helping of Navajo rice and Bolo beans. The plate is so hot they have to put it on a second plate just to serve it. As soon as they set it down, Crystal knew she would be no match for the meal, but that meant I would get to take some to work for lunch. I love Cuban sandwiches. You all know it, and I struggle passing them up any time I see one on the menu. 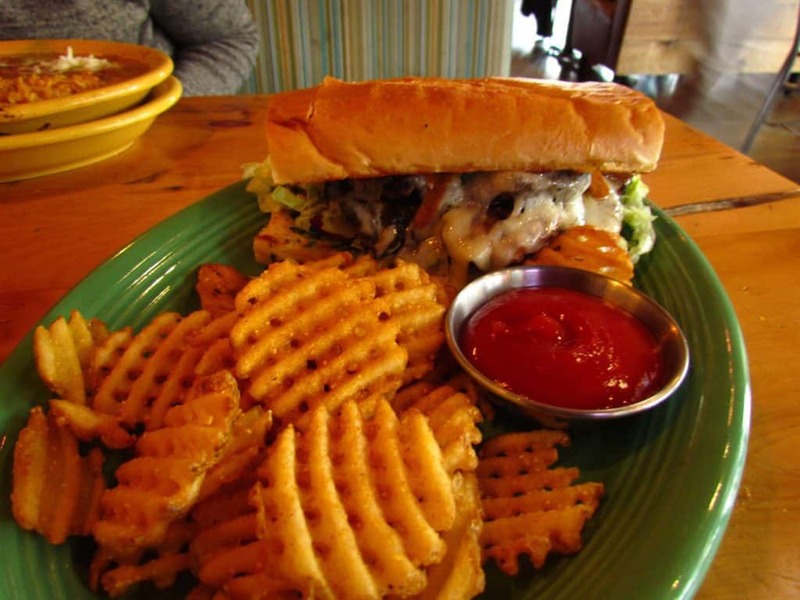 Fred and I had discussed Coco Bolos’ version of the sandwich, and he told me it would be unlike any I had ever tried. This piqued my interest to the point that I just had to test it out. Unlike the pressed sammies that I usually get served, this version is more in the range of an over-sized grilled pork sandwich. A heaping pile of wood-fired pork loin is flavored with Caribbean jerk seasoning. Toss on some ancho aioli, a bit of cilantro pesto, and melt some cheese over it to hold it all together. Then pile on some lettuce and tomato and stand back. While this was not truly in the flavor realm of a standard Cuban sandwich, it offered up a moist and flavorful dish that was unlike any combination I had tried. It certainly hit the spot, and I split it in half to save some for later. (It disappeared before I got to it, but that just means that our son got to taste the goodness, as well.) The dish also included a pile of waffle fries, that got munched on by both of us. By the end of our meals, we were both stuffed to the gills. Our server packed up our leftovers, and we thanked everyone for their hospitality. Now that we have broken the seal on this unique eatery, we can’t wait to return to test out more of their interesting dishes. 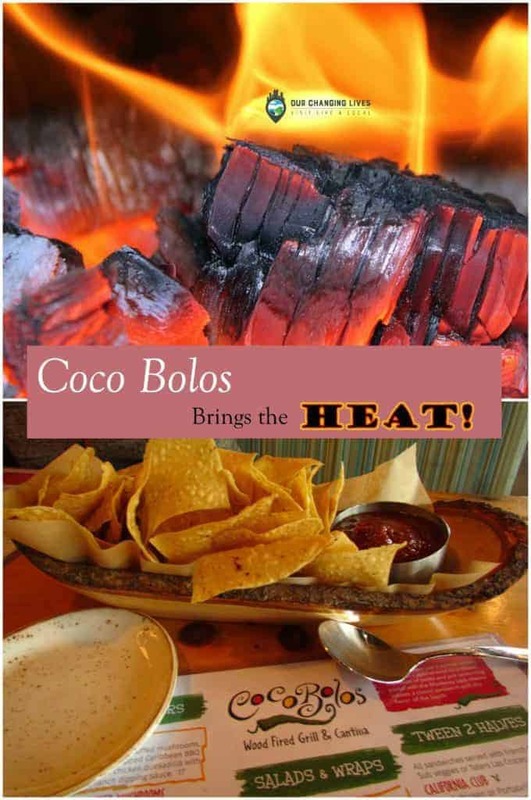 Have you ever visited Coco Bolos?